The Tarantula is essentially a giant man eating Tarantula. The Tarantula is slightly larger than a man. The Tarantula's main abilities are weaving webs, and climbing walls. There were two Tarantulas that appeared in Ultra Q and it was believed that they were a father and daughter that were turned into spiders after being bitten by a rare Tarantula. Both Tarantula's were killed the first was stabbed and the 2nd was run over by a car. This episode start off with a man breaking into a green house but he flees runs away because the green house holds a special breed of bees. Shortly after the break tremors and earthquakes begin happening in the area nearby. We learn after a train crash that the bees in the green house produce a special honey that cause rapid growth and that a mole managed to get into the green house when the glass was broken and eat some of the bees. The mole quickly became gigantic and was soon referred to as Mongular the giant mole. After we investigation we find out that one of the men who worked with the man developing the these bees was the one that purposely broke into the green house to try and sabotage the operation out of jealousy. The man was jealous that his colleague was getting a lot of praise and recognition for this scientific break through in growth. Realizing his mistake the man attempts to go into Mongulars cave and blow him up with TNT. The TNT unfortunately does not do the job meaning that the man sacrificed his life for nothing. The military then began fighting Mongular with tanks and rockets. The rockets cause the tunnels that Mongular dug to collapse on the nearby volcanic line. Mongular feel into the earth and was consumed by hot lava as the earth crumbled bellow it's feet. This was actually a really cool episode I enjoyed the battle sequence a lot at the end with the tanks, and rockets. They actually reused some footage from the movie Rodan for the volcanic scene which I thought was a nice easter egg. 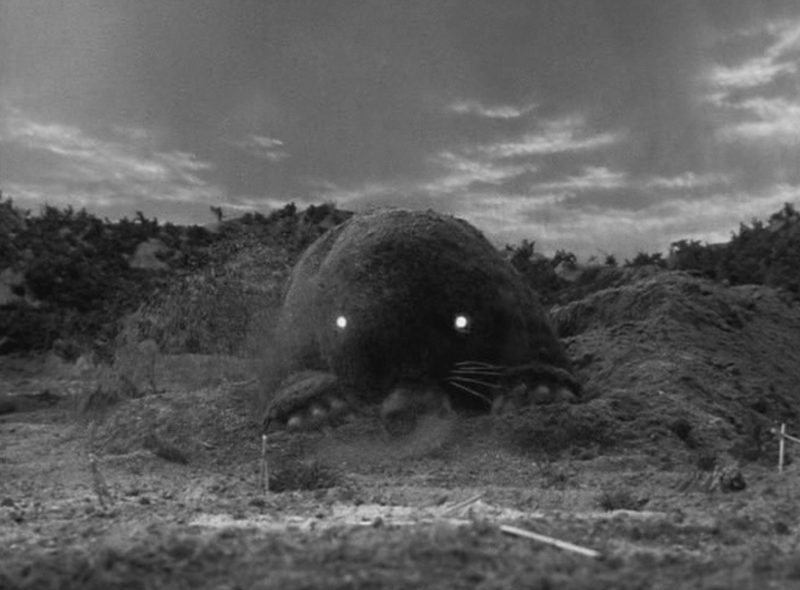 Mongular was a simple kaiju design basically just a giant mole no special powers or anything just able to dig deep underground. Another great episode of Ultra Q in the books. In this episode a group of friends out driving get lost and pull over a few of them fall into a swam and one almost drown so they decide to look for a place to to stay nearby. They discover an old abandoned mansion and decide to stay the night. While look walking around the house they start to notice that it is filled with a lot of spider webs and one of the friends tells a story about a rich man that owned a mansion that had a fascination with spiders. 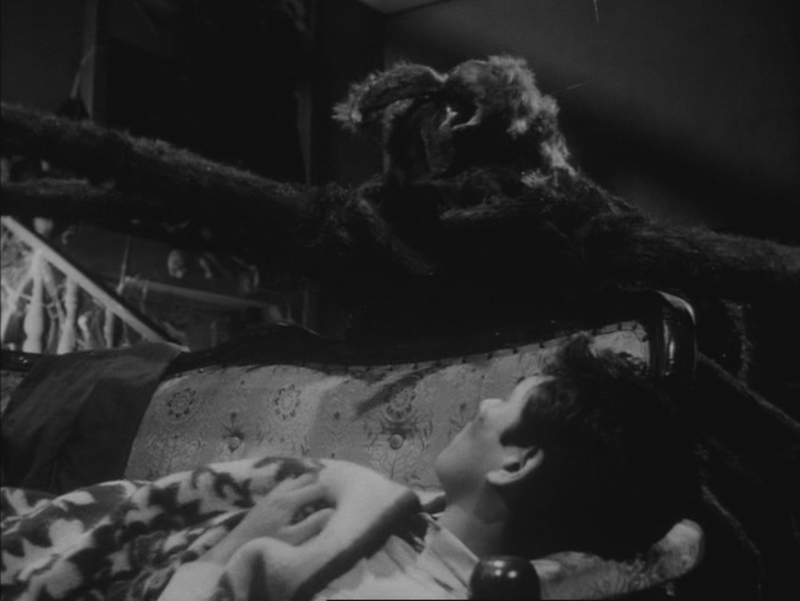 Apparently the rich man's daughter got bit by one of his rare spiders ,she died and came back as a giant spider. Apparently the rich baron went crazy and he died shortly after and also turned into a spider. We soon learn that the mansion they are staying in is the home of this legend and that the legend is indeed true. The 2 giant tarantulas begin attacking the friends one of the friends manages to kill one by stabbing with a knife that he found. After killing the one they fled the mansion while the 2nd tarantula chased them through the swamp. When the friends reached the car the ran over the 2nd tarantula and drove away as it flailed around and died. The mansion burned down shortly after the spiders death and sunk into the swamp, the fire must have been caused when one of the men threw a light candelabra at the first spider. This episode was pretty good it had more of a horror aspect to it than a sci-fi feel. 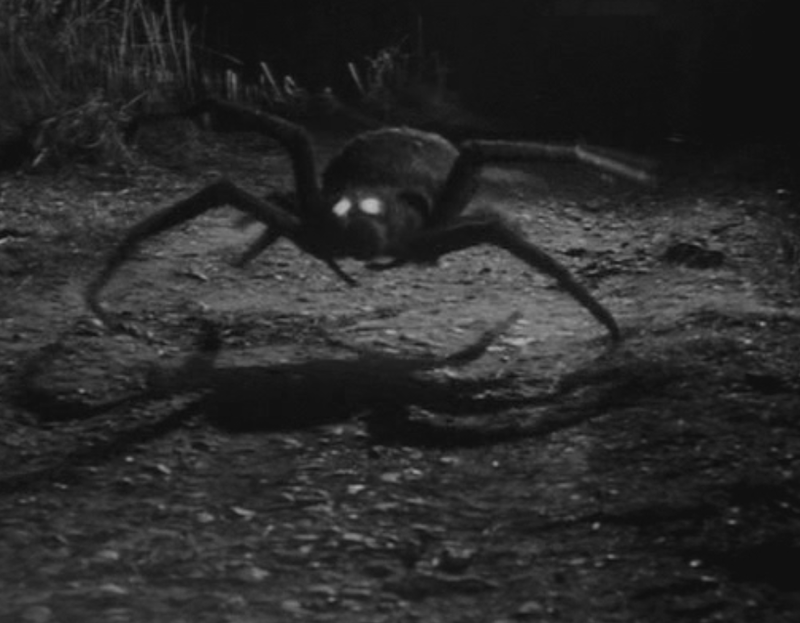 I really enjoyed the dark backstory to how the giant tarantulas came to be. 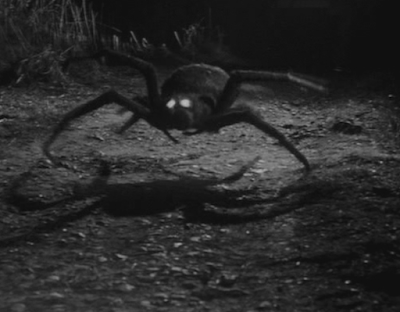 While the spiders were not massive they were still big enough to be considered kaiju in my book. I honestly think this episode would have even translated well into a movie. This episode is actually one of my favorite stories for an Ultra Q episode so far.